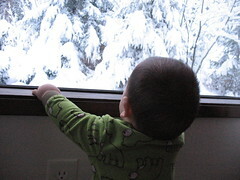 He can barely hold himself up to look out the window now and he was a bit startled by all the snow. So I'm telling myself that I'm going to start a long poem . . . only problem is what the hell do I want to write about for several poetic pages?